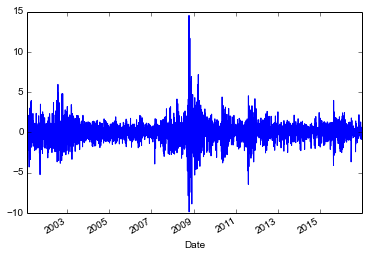 Okay so I am continuing my series of posts on time-series analysis in python. So far I have covered ARIMA models, ARIMAX models, and we also looked at SARIMA models. These posts have all dealt with a similar subject. Namely, how to make a time-series be stationary in the sense that it doesn’t have a mean dependent on time. We do this by differencing the time series, and when I say that I mean that generally to mean partial differencing and partial differencing reduction. The point is get rid of time dependence in the residual, and you can introduce that by over-differencing, and under-differencing, so ARIMA type models fix this through AR, and MA terms. This post is a little bit different. In this post, we want to remove the dependence of the error variance on time in order to get a better model. This is where my brain starts to push back on the need for a model like this. This would mean that my model is heteroscadastic, but not necessarily unbiased. If the expected value of my errors is zero, then I should get a solid unbiased estimate slap some robust standard errors on it, and there really is no need for this model. Okay, we’re done here, pack it up everyone, we don’t need GARCH, ARCH or whatever this thing is. Let’s go home. “What about simulating the value-at-risk from fraud? So that we can guess at how much ” the annoying part of my brain in the back shouts out. Well, I guess we could monte-carlo something with a distribution, but the volatility of the amount of money that we lose doesn’t appear to be normally distributed, but it does appear stationary. It looks like we have periods where the volatility in losses appears to be high, and then it dips down to low volatility periods. So we need some way to cluster that volatility. It looks like we need some sort of autoregressive process for volatility. Okay, so our data is going to come from yahoo finance. Specifically, we’ll be looking at the S&P 500 daily returns. This data presents a very useful case study for GARCH models. Here’s the reason: The stock market tends to be pretty clumpy. And what I mean by that is that days with a lot of volatility seem to cluster together. We’ll use this to assign a value at risk to the stock market. This is a useful method, because you can say that five days from now, I know that there will be a 5% probability that I will lose more than $1000 in the stock market or some similar value. This is directly analogous to the fraud loss situation which I have described above. For example, we might be interested to know, what is the maximum loss that I expect to lose in the next 30 days due to fraud losses given 5% probability that my loss will be no greater. Essentially, that is the same question, as how much am I going to lose in the stock market. So the question is, how can we obtain this data? Well here is some code that you will need to run to start things off. We’ll need these packages to get the data and analyze it how we wish. Here is the data to pull the data from the internet and plot it. You’ll see this plot when you run this piece of code. This is what the daily returns to the S&P 500 looks like over the last 16 years. We can fit a GARCH model to this data by calling the arch package that we downloaded earlier. coef    std err          t      P>|t|      95.0% Conf. Int. So at this point we can see a couple of things in the regression output. The beta coefficient is very close to 1 but a little bit lower. We would expect this. Basically, this is our MA term. If it was greater than 1 we would have a big problem. Essentially, when beta is bigger than 1, a small shock will grow and get louder and louder over time. In the mean this isn’t really a big deal. But in the variance of an estimator, we would have a huge problem. The variance would spiral to ever greater levels until, boom, it we hit infinite variance. Then regression would be impossible. So in terms of volatility of our model we want beta to be less than 1 in absolute value, but you can’t just take this term in isolation. Because the AR term has a similar effect, but most of the persistence should be captured in this term. omega is the baseline variance for the model. You can think of omega as what the variance would be if information about past variances were not being passed to the model. So the square-root of omega would be the standard deviation in returns. This coefficient suggests that the standard deviation of returns should be around 15% per day. That is fairly volatile, because it implies that returns should be around 0 every day but plus or minus about 29% returns are possible. An interesting thing seems to be that we never ever see a return of anywhere near 29% in the data. Why? Because of the autocorrelation in the series, it serves to dampen the volatility, and keep the relatively low volatility days clumped together. Finally, the alpha term tells us how much the previous period’s volatility to add to today’s volatility. It turns out that we shouldn’t expect too much clumping to be going on. According to this only about 10% of the previous days volatility will be carried over into the next day. Adding this with the beta coefficient gives a number of about 98%. If it were 100% we would have a random walk, but we see that we don’t quite have a random walk model. And it takes a really long time for a volatility regime to dissipate. This means that if we have a period of low volatility it will persist for quite some time. This helps to explain why we never see those 22% daily returns. We expect that our returns will be about 5.3% per day as indicated by the mu coefficient. The output let’s us preview the simulation results. Darker regions are more likely, lighter regions are less likely paths. It’s interesting because we can see that there are definitely days that are expected to have low volatility and days that we expect higher volatility. But we aren’t so concerned, for this example, with the path that we took to get to the end of the road. We just want to know what the end of the 30 day period is going to look like. So if you imagine that we are looking down on the above figure, the darker colors would represent taller objects, and the lighter ones would be shorter. So swinging around at a 90 degree angle, we would be looking at a histogram. So let’s take a look at the histogram for the last day on this plot. We printed the 5th percentile, as well. We can interpret the amount that gives us a 5% chance of having a loss greater than this amount. So we are expecting a loss of about 138% or greater with 5% probability. And then you can do all kinds of interesting stuff. Here is the histogram of returns. When retrieving the simulations from the model, i encounter a MemoryError. I am using a 365 day horizon, and the model is fitted on a lengthy time series. A memory error usually means that you ran out of RAM on your machine. This means you have 3 options. 1) Simulate a smaller number of observations. 2) Upgrade your computer by either installing more RAM, or buy a new computer with more. 3) Move the analysis to AWS or some other cloud service. I would personally do the first if you can get away with it, maybe reframe the problem to work with weekly data instead of daily. If you have to do 365 days, then go with option 3 since you will learn to do things remotely. That is a valuable skill in itself. I had the same problem, although there were some 5 GB of free RAM. I ran the script in a 64-bit python and it helped! I hope it help a reader as well! Thanks for this example of using using GARCH in Python – I don’t think there are many online! I think that you are right as rain. That’s what I get for writing it up super fast and posting it pretty late. Thanks for the heads up.